ERP is usually referred to as a category of business-management software—typically a suite of integrated applications—that an organization can use to collect, store, manage and interpret data from these many business activities. Not all ERP packages developed from a manufacturing core; ERP vendors variously began assembling their packages with accounting, maintenance, and human-resource components. By the mid-1990s ERP systems addressed all core enterprise functions. Governments and non–profit organizations also began to use ERP systems. Government resource planning) (GRP) is ERP for public sector, and an integrated office automation system for government bodies. The software structure, modularization, core algorithms and main interfaces do not differ from other ERPs, and ERP software suppliers manage to adapt its systems to government agencies. Two-tier ERP software and hardware lets companies run the equivalent of two ERP systems at once: one at the corporate level and one at the division or subsidiary level. For example, a manufacturing company uses an ERP system to manage across the organization. This company uses independent global or regional distribution, production or sales centers, and service providers to support the main company’s customers. Each independent center or subsidiary may have its own business models, workflows, and business processes. The term "postmodern ERP" was coined by Gartner in 2013, when it first appeared in the paper series "Predicts 2014". According to Gartner's definition of the postmodern ERP strategy, legacy, monolithic and highly customized ERP suites, in which all parts are heavily dependable on each other, should sooner or later be replaced by a mixture of both cloud-based and on-premise applications, which are more loosely coupled and can be easily exchanged if needed. There is, however, no golden rule as to what business functions should be part of the core ERP, and what should be covered by supplementary solutions. According to Gartner, every company must define their own postmodern ERP strategy, based on company's internal and external needs, operations and processes. For example, a company may define that the core ERP solution should cover those business processes that must stay behind the firewall, and therefore, choose to leave their core ERP on-premise. At the same time, another company may decide to host the core ERP solution in the cloud and move only a few ERP modules as supplementary solutions to on-premise. The main benefits that companies will gain from implementing postmodern ERP strategy is speed and flexibility when reacting to unexpected changes in business processes or on the organizational level. With the majority of applications having a relatively loose connection, it is fairly easy to replace or upgrade them whenever necessary. In addition to that, following the examples above, companies can select and combine cloud-based and on-premise solutions that are most suited for their ERP needs. The downside of postmodern ERP is that it will most likely lead to an increased number of software vendors that companies will have to manage, as well as pose additional integration challenges for the central IT. ↑ Almajali, Dmaithan. "Antecedents of ERP systems implementation success: a study on Jordanian healthcare sector". Emeralad. Retrieved January 6, 2016. ↑ Shaul, L.; Tauber, D. (2012). "CSFs along ERP life-cycle in SMEs: a field study". Industrial Management & Data Systems. 112 (3): 360–384. doi:10.1108/02635571211210031. ↑ Khosrow–Puor, Mehdi. (2006). Emerging Trends and Challenges in Information Technology Management. Idea Group, Inc. p. 865. ↑ InfoWorld, Heather Harreld,. "Extended ERP technology reborn in B2B". Retrieved 2016-07-20. ↑ Anderegg, Travis. "MRP/MRPII/ERP/ERM — Confusing Terms and Definitions for a Murkey Alphabet Soup". Retrieved September 23, 2013. ↑ "ERP". Retrieved October 7, 2009. ↑ Sheilds, Mureell G. (2005). E-Business and ERP: Rapid Implementation and Project Planning. John Wiley and Sons, Inc. p. 9. ↑ Chang, SI; Guy Gable; Errol Smythe; Greg Timbrell (2000). A Delphi examination of public sector ERP implementation issues. International Conference on Information Systems. Atlanta: Association for Information Systems. pp. 494–500. Retrieved September 9, 2008. ↑ Thin Enterprise Resource Planning (Second ed.). Boston: Thomson Course Technology. 2006. ISBN 0-619-21663-8. ↑ "ERP: What you need to ask before you buy". projectauditors.com. Retrieved April 23, 2014. ↑ "The Bryan School of Business and Economics at UNCG—Exceptional Problem Solvers" (PDF). Uncg.edu. Retrieved November 8, 2012. ↑ Charles Møller (2005-08-01). "ERP II: a conceptual framework for next‐generation enterprise systems?". Journal of Enterprise Information Management. 18 (4): 483–497. doi:10.1108/17410390510609626. ISSN 1741-0398. ↑ Ruhi, Umar (2016-07-01). "An experiential learning pedagogical framework for enterprise systems education in business schools". The International Journal of Management Education. 14 (2): 198–211. doi:10.1016/j.ijme.2016.04.006. ↑ Shaul, L.; Tauber, D. (2013). "Critical Success Factors in Enterprise Resource Planning Systems: Review of the Last Decade". ACM Computing Surveys. 45 (4). ↑ Sheilds, Mureell G., E-Business and ERP: Rapid Implementation and Project Planning. (2001) John Wiley and Sons, Inc. p. 9-10. ↑ Yunliang, Xiongtao, Qing, Jing and Ning (2010) "Design of E-Government Information Management Platform Based on SOA Framework", 2010 First International Conference on Networking and Distributed Computing, Hangzhou, DOI 10.1109/ICNDC.2010.42. ↑ Allen, Kern and Havenhand (2000) "ERP Critical Success Factors: an exploration of the contextual factors in public sector institutions", Proceedings of the 35th Hawaii International Conference on System Sciences. ↑ Chang, Gable, Smythe and Timbrell (2000) "A Delphi examination of public sector ERP implementation issues" Proceedings of ICIS. ↑ Wingreen, Maryam and Hritik (2014) "An Investigation into Enterprise Resource Planning Implementation Success: Evidence from Private and Public Sector Organizations", PACIS 2014/339. ↑ Shafqat, Enhong and Faisal (2012), "Enterprise Resource Planning - 'real blessing' or 'a blessing in disguise': an exploration of the contextual factors in public sector"
↑ Coelho, Cunha and Meirelles (2015) "The client-consultant relationship in the implementation of ERP in government: exploring the dynamic between power and knowledge". DGO, DOI 10.1145/2757401.2757405. ↑ Costa, C.; Ferreira, E.; Bento, F.; Aparicio, A (2016). "Enterprise resource planning adoption and satisfaction determinants". Computers in Human Behavior. 63: 659–671. doi:10.1016/j.chb.2016.05.090. ↑ "Enhanced Project Success Through SAP Best Practices – International Benchmarking Study". ISBN 1-59229-031-0. 1 2 "ERP (Enterprise Resource Planning)". Tech-faq.com. March 5, 2014. Retrieved July 14, 2015. 1 2 "Critical Issues Affecting an ERP Implementation". Information Systems Management. Auerbach Publications. 1999. p. 7. Retrieved January 10, 2013. ↑ "Wal-Mart slow to roll out new replenishment system". Arkansas: Thecitywire.com. January 8, 2014. Retrieved July 14, 2015. ↑ Brown, C.; Vessey, I. (2003). "Managing the Next Wave of Enterprise Systems: Leveraging Lessons from ERP". MIS Quarterly Executive. 2 (1). ↑ King. W., "Ensuring ERP implementation success," Information Systems Management, Summer 2005. ↑ Yusuf, Y., A. Gunasekaran, and M. Abthorpe, "Enterprise Information Systems Project Implementation: A Case Study of ERP in Rolls-Royce," International Journal of Production Economics, 87(3), February 2004. ↑ Maya Daneva, Roel Wieringa. "Requirements Engineering for Cross-organizational ERP Implementation: Undocumented Assumptions and Potential Mismatches" (PDF). University of Twente. Retrieved July 12, 2008. 1 2 Thomas H. Davenport, "Putting the Enterprise into the Enterprise System", 'Harvard Business Review', July–August 1998. ↑ Ferdows, K (1997). "Making the most of foreign factories". Harvard Business Review. 75 (2): 73–88. ↑ Gill, R. (2011). 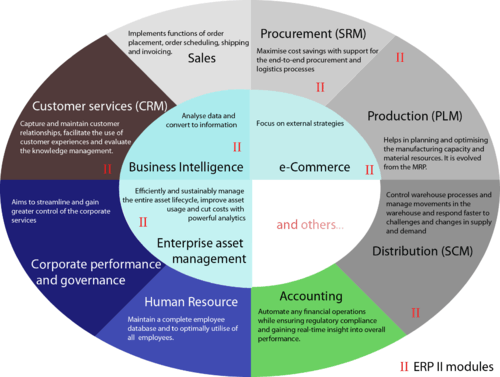 "The rise of two-tier ERP." Strategic Finance, 93(5), 35-40, 1. ↑ "Technical Workflows". CEITON. Retrieved July 14, 2015. ↑ Montgomery, Nigel (2010). "Two-Tier ERP Suite Strategy: Considering Your Options." Gartner Group. July 28, 2010. Retrieved September 20, 2012. ↑ Kovacs, G. L.; Paganelli, P. (2003). "A planning and management infrastructure for large, complex, distributed projects — beyond ERP and SCM". Computers in Industry. 51 (2): 165–165. doi:10.1016/s0166-3615(03)00034-4. ↑ Kraemmerand, P.; et al. (2003). "ERP implementation: an integrated process of radical change and continuous learning". Production Planning & Control. 14 (4): 228–248. ↑ Vilpola, Inka Heidi (2008). "A method for improving ERP implementation success by the principles and process of user-centred design". Enterprise Information Systems. 2 (1): 47–76. doi:10.1080/17517570701793848. 1 2 Fryling, Meg (2010). "Estimating the impact of enterprise resource planning project management decisions on post-implementation maintenance costs: a case study using simulation modelling". Enterprise Information Systems. 4 (4): 391–421. doi:10.1080/17517575.2010.519785. ↑ Yakovlev, I.V. (2002). "An ERP implementation and business process reengineering at a Small University". Educause Quarterly. 2: 52–57. ↑ Fryling, Meg (2010). Total Cost of Ownership, System Acceptance and Perceived Success of Enterprise Resource Planning Software: Simulating a Dynamic Feedback Perspective of ERP in the Higher Education Environment. ProQuest Dissertations and Theses database. p. 403. ISBN 978-1-109-74428-6. ↑ Ramaswamy Nilesh V K (September 27, 2007). "Data Migration Strategy in ERP". Retrieved April 8, 2008. ↑ Walsh, Katherine (January 2009). "The ERP Security Challenge". CSOonline. CXO Media Inc. Retrieved January 17, 2008. ↑ O'Brien, James (2011). Management Information Systems(MIS). New York: McGraw-Hill, Irwin. p. 324. ↑ Young, Joanna. "AUDIO | Best-of-Breed vs. ERP: What's Best for Higher Ed Today?". The EvoLLLution. Retrieved July 14, 2015. ↑ "The Minefied of Harmonising ERP". Cfo-insight.com. July 23, 2012. Archived from the original on July 27, 2012. ↑ "Predicts 2014: The Rise of the Postmodern ERP and Enterprise Applications World". www.gartner.com. Retrieved 2016-10-31. ↑ "Postmodern ERP Strategy Is Not a Best-of-Breed Approach". www.gartner.com. Retrieved 2016-10-31. ↑ Review, CIO. "5 Factors Facilitating the Transition to the Postmodern ERP Era". CIOReview. Retrieved 2016-10-31. Grant, David; Richard Hall; Nick Wailes; Christopher Wright (March 2006). "The false promise of technological determinism: the case of enterprise resource planning systems". New Technology, Work & Employment. 21 (1): 2–15. doi:10.1111/j.1468-005X.2006.00159.x. Loh, Tee Chiat; Lenny Koh Siau Ching (September 2004). "Critical elements for a successful ERP implementation in SMEs". International Journal of Production Research. 42 (17): 3433–3455. doi:10.1080/00207540410001671679. Shaul, Levi; Tauber Doron (September 2010). "Hierarchical examination of success factors across ERP life cycle". MCIS 2010 Proceedings. : 79. Head, Simon (2005). The New Ruthless Economy. Work and Power in the Digital Age. Oxford UP. ISBN 0-19-517983-8. Waldner, Jean-Baptiste (1992). Principles of Computer Integrated Manufacturing. Chichester: John Wiley & Sons Ltd. ISBN 0-471-93450-X. Waldner, Jean-Baptiste (1990). Les nouvelles perspectives de la production. Paris: DUNOD BORDAS. ISBN 978-2-04-019820-6. Lequeux, Jean-Louis (2008). Manager avec les ERP, Architecture Orientée Services (SOA). Paris: EDITIONS D'ORGANISATION. ISBN 978-2-212-54094-9. Clemons, E.K. ; Kimborough (1986). "IS for Sustainable Competitive Advantage". Information & Management. 11 (3): 131–136. doi:10.1016/0378-7206(86)90010-8. Wikimedia Commons has media related to Enterprise resource planning.